Acing the ACT is a streamlined ACT prep book featuring concise lessons that will boost scores dramatically by teaching students how the trickiest ACT questions on all four sections are presented and the offering the best approaches for getting to the right answer quickly. In Acing the ACT, internationally renowned tutor Elizabeth King delivers more than a decade’s worth of secret insights for unlocking solutions to the trickiest questions on the ACT. She offers her closely guarded personal tips in stress-free, down-to-earth language that’s easy to understand and remember. No matter how you read this pocket guide—cover to cover, or skipping around—these strategies will make your score pop, even if you’re already a top scorer. Whether you’re studying months ahead, or prepping last-minute, Acing the ACT delivers higher scores, fast. It always feels scary to tell secrets, you know? …especially when your secrets give you the advantage. After all, each year my team and I are the secret weapons of students from all over the world who want to attend the very best colleges and universities in the United States. We make ACT scores soar to such a degree that we all feel a little bit guilty about it. In fact, we offer such an edge that most of our students won’t even tell their classmates they’re working with us. The observations and insights in Acing the ACT are my private, personal notes on the ACT. These notes are my own secret weapons. They’re not the basics; they’re what set my team and me apart. So here I am, a little nervous to let the cat out of the bag. I realized decades ago that I’m someone who’s naturally very good at standardized tests. I’ve since spent well over the last decade teaching students from New York to Athens, Beverly Hills to Venezuela, and Miami to Kuwait how to think about tests like I do. All that teaching has given me a lot of time to observe. I’ve observed what my students actually know—and what they really don’t know. I’ve observed how they think and what they’re afraid of. I’ve observed how the test makers make the complex deceivingly simple and the simple deceivingly complex—what I call the “trick(y)” questions, the ones that students anguish over. Most importantly, I’ve figured out how to get my students over those hurdles so they can create incredible score gains for themselves and get into their dream schools. Even the trickiest questions on the ACT are full of nuanced predictability, hidden in plain sight. We’re focusing specifically on those types of questions in Acing the ACT. Again, this is all about secrets, tricks, weird questions, and a look at the meaner strategies of the ACT test makers. While the book does not offer sample tests, I think what it does cover is extremely valuable. We’ve had multiple books with practice tests in them and they have not been touched by my kids who took the ACT already. It takes a very dedicated student to weed through practice tests. This book on the other hand is a far less intimidating book that could be read in a few hours. It really condenses the very best advice into a small space. I handed it to my twelve year old and he found it quite fascinating and I think it will help take away some of the fear of what he’ll face when he takes the ACT for the first time. My high schooler is prepping to take the ACT this summer, and we discovered a fantastic pocket guide to help him learn the essentials for this exam. 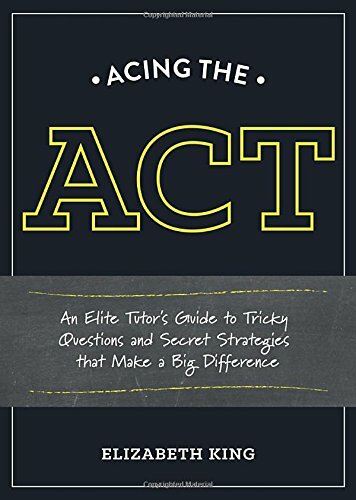 Acing the ACT: An Elite Tutor’s Guide to Tricky Questions and Secret Strategies that Make a Big Difference by Elizabeth King shares all the basics students need to know to score higher on the ACT. It is a short, compact book that’s easy to pick up and read in small increments. This makes it seem easier and less time consuming than if it had been presented in a large workbook format like many test prep books are. Those books are overwhelming to my son, so Acing the ACT is just right. Though it can be read cover-to-cover, Acing the ACT is like a field guide, which makes accessing specific parts a breeze. The author provides lots of great tips and practical advice, such as knowing how certain questions can trick you and whether or not to guess. The memorization pages are golden! These take the guesswork out of what to know for the math portion and give you all the info right there for brushing up on those pesky formulas. My favorite part: the reminders about what is really most important about the ACT. Hint: it’s not what you’d think.